Printed electronics are anticipated to be one of the fastest growing technology sectors. With an increasing reliance on electronic publishing, traditional printing companies have been experiencing declining revenues. 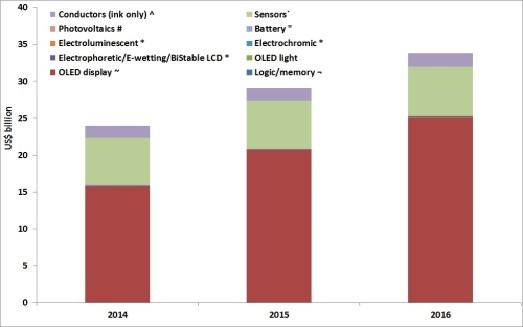 The industry is hoping that printed electronics will reverse the concerning trend. R&D tax credits are available to help facilitate this transition from prior generation printing technologies. Electronic newspapers and magazines have significantly replaced the traditional ink-on-paper printing industry. Printing companies that hope to survive in this new electronic oriented atmosphere are being forced to rethink their strategies. They need to create new products in order to prosper in the rapidly accelerating electronics environment. Printed electronics provides a good alternative. Printed electronics is a broad term used for a range of different printer technologies. Generally, it involves the use of 3D printers to create electronic components by stacking layers of electronically conducive ink on top of each other to achieve a desired form. Constructing electronics on non-conventional substrates, such as paper, clothes and plastics, can benefit a range of technologies, including flexible displays, paper electronics, bio-integrated sensors, wearable clothing and more. Due to their widespread practical uses many analysts expect this emerging field to grow from its current annual revenue level of $16 billion in 2013 to $76 billion by 2023 . Conversely, traditional printing which involves the use of common printing equipment to define patterns on two dimensional materials, is roughly a $76 billion industry (as of 2012) and has been declining at a rate of about 5% annually since its peak in 2000 when the industry had $165 billion in annual revenue. The declining revenues in the traditional printing industry and the inverse in the printed electronics industry provide a good opportunity for traditional printing companies who are seeking a solution to the declining revenues trend. 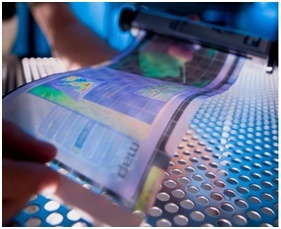 *IDTechEX "Printed, Organic, & Flexible Electronics Forecasts, Players & Opportunities 2014-2024". R.R. Donnelley & Sons, Co.
R.R. Donnelley & Sons, Co. the 150-year-old printing giant in Chicago has recognized the opportunity. CEO Thomas J. Quinlan III plans to diversify beyond traditional printing, which now accounts for only 24% of sales, down from 70% in 2000. 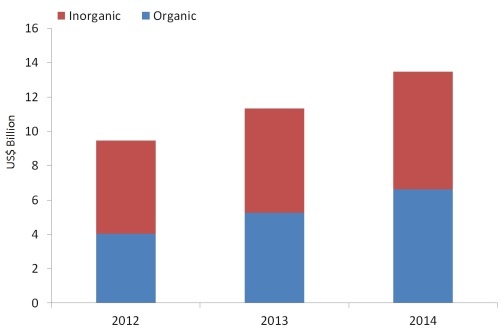 When the company began searching for new sources of revenue around 2009 it saw the emerging field of printed electronics as a good market replacement. The company anticipates that printed electronics will actually replace traditional methods of production in a vast array of industries. Antennas for RFID tags, for example, will generate about $9 billion of sales this year. The antennas are embedded in packing labels, stickers and tags the size of credit cards that can be loaded with digital information and then read by smart phones or other devices via short-range wireless networks. Currently, only about 1% of those antennas are created using the printed electronics method. Some analysts predict that over the next ten years printed electronics could capture about 50% of this market. The process has other applications as well. For instance, Donnelley is building batteries that can be printed on the surface of fraud-protected credit cards and act as a source of power to produce lighted images on the cards. The new printing method can also create various electronic sensors. At least some variation of electronic sensors are used in virtually every electrical product created. This provides an incalculable opportunity for the electronic printing industry to seize upon. With printed electronics, an electronically conducive type or blend of ink is chosen as an appropriate printing material. This may include any solution-based formula depending on the product being created. A suitable printing process is similarly chosen based on the materials involved and the task at hand. Creating and matching the material with the appropriate printing process creates a wide array of options which makes the development of printing methods and the choice of ink materials the field’s essential tasks. Industry leaders typically invest heavily in R&D in pursuit of this end. Developers must overcome other significant technological hurdles as well. Wearable technology includes glasses, jewelry, headgear, belts, arm wear, wrist wear, leg wear, skin patches, exoskeletons, and e-textiles. Much of this technology is made possible using printed electronics. Large players such as Apple, Accenture, Adidas, Fujitsu, Nike, Phillips, Reebok, Samsung, SAP and Roche have all recognized the opportunities in this segment and are behind promising new developments, many of which are beginning to emerge from the R&D phase. Google recently announced a contact lens product that uses printed electronics to measure glucose levels for diabetics. This project in which Google has partnered with Novatis, the pharmaceutical giant, provides an example of the billions of dollars in potential revenue available across the digital healthcare market, which is probably the largest source of revenue for wearable technology. Researchers at the University of Michigan are creating an ultrathin light detector that can sense wavelengths not visible by the naked eye. This new innovation has the potential to put heat vision technology into a contact lens. OM signal, the Montreal startup company, is banking on the future of the wearable’s market in which clothes gather information about a person’s health. Their exercise shirts contain sensors that measure breathing, heart rate and calories burned. The measurements are transmitted to a mobile app so users can evaluate their progress and compete against each other. Bio-signals translated into readable gauges can inform them how to operate at optimal efficiency by recommending when to slow down, speed up or take a break. This technology could provide very meaningful data for conscientious users. Traditionally, the most common self-monitoring tool was the scale in the master bathroom. After a period of overindulgence one might step on it only to realize that they gained much more weight than they realized. With wearables one can now monitor heart rate, blood pressure, temperature fluctuations, stress patterns, calorie burn rate and other physical/physiological data all providing real insight about the state of the user’s health and how it has been evolving over time. This data is useful not just for exercise enthusiasts. With widely available non-stop insight into large numbers of users, professionals and researchers will be given the tools to provide in depth analysis across broad spectrums of the population. Doctors may rely on them for their diagnosis while fitness coaches and trainers would use them when planning workout regimens. Despite these benefits wearables, like all new technologies, they face some key challenges. Particularly, researchers struggle to produce smaller, more efficient, non-invasive products while integrating more sensors to provide better data. Flexible batteries and chargeable products that can react instantly are still largely in the R&D phase. Data storage and privacy solutions require some further development as well. The cloud infrastructure needed to support the massive amount of data that will be generated is not completely in place and R&D will always be continuous in order to combat hackers and identity thieves. For more information about wearable electronics see our article “The R&D Tax Credit Aspects of Electronic Wearables”. Many analysts expect smart labels to replace the traditional silicon processors found on typical retail items. These smart labels are best created using electronic printing. They contain sensors used to collect data in order to provide information such as temperature records of perishable food/medications or that which can be used in inventory management and asset tracking. Radio-frequency identification tags (RFID) are intelligent bar codes that communicate with a network in order to provide automatic and detailed information about the product they are attached to. With the use of RFID technology the inventory process becomes almost fully automated. It largely eliminates the need for the object to be recorded manually with the use of a hand held scanner. Many analysts look forward to the day where the check out process at the grocery store is largely eliminated. Instead of a clerk scanning each item, the products in your cart will automatically communicate with the network in order to generate the grocery bill. As you place products in and out of your shopping cart the RFID sensors will alert your i-phone, adjusting the tab. Still RFID technology has many challenges. Reader collision occurs when the signals from two or more readers overlap. The tag is unable to respond to simultaneous queries. Tag collision, a similar problem, occurs when many tags reflect signals back to the reader at the same time. The reader often has difficulties responding to this large volume of data. Systems must be carefully set up to avoid these problems. They do this by isolating individual tags. For example, with a “gap pulse” method each tag consults a random number counter which tells it how long to wait before sending its data. Methods such as this often solve the technological hurdles after an often intensive process of experimentation. Nonetheless, the technology costs need to be slightly reduced in order to make the applications widespread. With RFID technology, item level tagging is generally considered economically feasible only when the cost per tag drops below 5 cents. Conventional silicone tagging costs about 13 cents per tag and is unlikely to drop below the five cent per item range. This realization has generated substantial interest in the RFID method which provides better potential. Implementing these systems and finding ways to manufacture them at cheaper costs often involves an intensive trial and error process of experimentation. This is the type of activity which normally triggers the R&D tax credit. For more information about RFID and Smart sensors see our articles “R&D Tax Aspects of Radio Frequency Identification” and “The R & D Credit Opportunity for Smart Sensors”. The global flexible electronics market is expected to reach $13.23 billion by 2020, at an estimated compound annual growth rate (CAGR) of 21.73%. Of this, North America is the largest market followed by Europe and the Asia Pacific region. Large opportunity lies within this sector; however, researchers that can best figure out how to provide functional, lightweight and versatile products that operate without deterioration in performance will be the ones most likely to succeed. The ability to bend flexible electronics products provides utility but also creates significant challenges. In a conventional LCD display, the liquid crystals within the pixels need to be perfectly positioned between two sheets of glass. These sheets cannot be bent without misaligning the pixels which are illuminated by a backlight. Flexible electronics engineering however is different. With this each pixel glows on its own, thus allowing for the flex. Sti ll, other component parts inside need to survive being bent. These different layers of components (the battery, the electronics, and the touch component) are usually stacked. But, the inner layers need to bend more than the outer ones while still being properly aligned. Achieving this involves a significant amount of scientific experimentation. Some researchers look to stretchable electronics as a solution. However, stretchable electronics contain their own challenges. Like most printed electronics, researchers struggle to create products that retain full function-ability after multiple bends or stretches. Inorganic electronic materials have been applied in many fields due to their reputation for high performance, stability and reliability. These capabilities have attracted much attention from scientists and industrialists throughout the industry. This has led to accelerated progress in various industry segments involving printed conductors, transistors, solar cells and quantum dot LED. Nevertheless, these advances are limited by certain hurdles. Solution processing is rather complex and the temperatures necessary to obtain sufficient performance are too high for the most common inexpensive flexible substrates. However, researchers at MIT believe that by exploiting the reduced melting point and high solubility of nano-particles, they have demonstrated that inorganic materials can be processed at plastic-comparable temperatures. This process however is still largely in the R&D phase. For now, the technology remains very useful in instances where there is a failure to reduce processing temperatures in order to take advantage of the cheaper organic process. Organic Printed electronics refers to the conventional method of printing electrical components on light, flexible, cheaper to make and easier to shape plastics. Although this material provides some processing benefits its major drawback involves durability and higher voltage restrictions. Overcoming these challenges involves significant R&D. For products that need increased durability and require processing at low temperatures scientists should consider their alternatives in achieving low temperature processing with Inorganic materials or creating durable products with organic electronics. *IDTechEx "INorganic and Composite Printed Electronics 2012-2022: Needs, Opportunities, Forecasts". PARC is an independent, wholly owned subsidiary of Xerox that specializes in innovation and R&D services. They provide custom R&D services, technology, knowledge, and intellectual property to Fortune 500 and Global 1000 companies, startups, and government agencies and partners . Since PARC was created, it has pioneered many technology platforms. Some examples include the Ethernet, laser printing, ubiquitous computing, and the graphical user interface (GUI). Today, they continue their physical, computer, and social sciences research which enables breakthroughs for their clients' businesses. Recently, researchers at PARC have created a new method of manufacturing electrical motherboards. The method involves chopping up semiconductors into very small “chiplets” about the size of a human hair and mixing them into an ink solution that generates positive and negative charges. The ink chiplets are then guided to the precise location of a glass substrate, using electrical fields that are generated by wires in a spiral pattern. From there, a specialized roller picks them up and places them on a plastic substrate, where a 3D printer wires them together. It usually takes an electrical engineer like Eugene Chow, Ph.D in electrical engineering a lead scientist at PARC, to understand exactly how this process works. What is important is that the technology has the potential to allow for the electrical printing of high-grade performance chips, something the industry is currently struggling to accomplish. The process contains many hurdles as it is still in a very early state of development but it could possibly further broaden the reach of electrical printing and open up thousands of more practical uses. Soligie Printed Electronics located in Savage, Minnesota provides custom, robust, repeatable manufacturing solutions for printed electronics by leveraging multiple printing platforms with a deep materials knowledge and experience. Soligie partners with customers to meet their unique requirements from concept design to volume manufacturing with a continuous focus on quality management. Their vision is to be the premier resource for advancing programs to commercialization with their partners by leveraging expertise and innovation in flexible electronics. Their mission is to deliver comprehensive solutions by optimizing, applying, and integrating technologies, enabling their customers to realize successful new products. This innovation and resulting differentiation drive growth for Soligie and their partners. Last December, FlexTech Alliance presented two R&D awards to Soligie. The purpose of the awards was to advance flexible, printed electronics manufacturing. The team will develop and demonstrate a sensor platform leveraging printed components and silicon-on-polymer technology to achieve a thin, conformable and lightweight form factor. The goal is commercializing a sensing system consisting of a power source, microcontroller, display, and wireless communication channel, as well as an interchangeable or disposable portion that can be chosen by the user based on the application. Commercial and military applications include vital sign monitoring, environmental monitoring, point-of-care diagnostics, structural health monitoring, and many others. There is a tremendous amount of research being done in the field of printed electronics at the university level. Industries often collaborate with the universities to achieve their research and development goals. Many successful companies in various industries including printed electronics have been formed out of start-ups launched from the universities. MC10, a 30-person Cambridge, Mass based start-up company, recently raised $10 million to create products such as skin-stickers to perform functions such as the monitoring of a baby’s fever or to replace traditional pacemakers inside the body. Investors included Medtronic in Minneapolis, North Bridge Venture Partners in Massachusetts, and Braemar Energy Ventures in New York. In 2008, Western Michigan University (WMU) formed the Center for the Advancement of Printed Electronics (CAPE). WMU is well-known for its knowledge on printing. Led by its director, Dr. Margaret Joyce, CAPE is utilizing its inkjet, gravure, screen and flexo capabilities to look at some of the challenges facing the PE field, most notably the ability to integrate materials into the printing process. The Georgia Institute of Technology is the home of the Center for Organic Photonics and Electronics (COPE). Established in 2003, COPE works closely with many of the research centers and institutes at Georgia Tech to provide a focal point for campus-wide efforts on functional organic optical and electronic materials. Led by Co-directors Bernard Kippelen and Seth Marder, COPE is developing new materials and device concepts for organic light-emitting diodes (OLEDs), organic field-effect transistors, memories, capacitors, photodiodes and solar cells, which can then be incorporated into displays, image sensors, and radio-frequency identification tags. COPE is also working with Solvay S.A. to develop organics-based thin-film transistors that can be fabricated onto low-cost flexible substrates at low temperature for applications in plastic electronics. The OE-A describes itself as the leading international industry association for organic and printed electronics. Its members include world-class global companies and institutions ranging from R&D institutes, component and materials suppliers to producers and end-users. This includes over 220 companies from Europe, North America, Asia and Australia who work together to foster collaboration by all participants of the value chain, starting with the Research and Development phase and continuing through final end-users of the product. It does this by issuing public relations campaigns, initiating R&D activities for devices that demonstrate the capabilities of emerging electronics, and providing information to guide R&D funding. Basically, it links the gap between academia and industry. This type of collaboration promoting Research and Development is something that is being stressed lately throughout all innovating industries. Nothing spurs the embracing of new technology like the demise of an existing industry. R&D tax credits are available to help those printers who are making the effort to transform their business.